We’d love your help. Let us know what’s wrong with this preview of These Truths by Jill Lepore. Written in elegiac prose, Lepore’s groundbreaking investigation places truth itself—a devotion to facts, In the most ambitious one-volume American history in decades, award-winning historian and New Yorker writer Jill Lepore offers a magisterial account of the origins and rise of a divided nation, an urgently needed reckoning with the beauty and tragedy of American history. To ask other readers questions about These Truths, please sign up. Does anyone else question this statement, "In Norfolk, Virginia, four thousand slaves—who, living in a border state that was not part of the Confederacy, were not actually freed by the Emancipation Proclamation—paraded through the streets with fifes and drums, imitating the Sons of Liberty.". Virginia not part of the Confederacy? Not sure what page this is from because I'm reading the Kindle version. Jill Lepore's These Truths is a massive (932 pages) and beautifully-written new history of the United States from Columbus to the Age of Donald Trump. It raises the critically important question of whether a nation founded on the principles expressed in the Declaration of Independence and the Constitution can survive under the assault of the Internet, talk radio, twenty-four-hour cable "news," and all of the other maladies that now afflict the nation's democracy. The depth of Lepore's research is Jill Lepore's These Truths is a massive (932 pages) and beautifully-written new history of the United States from Columbus to the Age of Donald Trump. It raises the critically important question of whether a nation founded on the principles expressed in the Declaration of Independence and the Constitution can survive under the assault of the Internet, talk radio, twenty-four-hour cable "news," and all of the other maladies that now afflict the nation's democracy. The depth of Lepore's research is nothing less than astounding. The book reflects the latest scholarship and illustrates the fact that, contrary to the arguments of an earlier generation of American historians, the nation's development has not been one glorious march along the road to progress. Rather, we have proceeded in fits and starts. Our history has been characterized by periods of reform alternating with times of retreat. We have enjoyed times of great economic prosperity only to have them shattered by periodic economic collapses. We have been led by men and women of brilliance, courage and foresight, but we have also on occasion fallen prey to scoundrels and charlatans. Ours is a complex history, marked by moments of selfless sacrifice and great triumph, but marred by injustice and tragedy as well. For much of our history, many of the nation's citizens, especially women along with blacks and other minorities, have been denied the opportunity to participate fully in the society and especially in its political life. Thus the struggle to provide equal opportunity for all Americans has been a long-running theme of American politics, ever since the days when the right to vote and to otherwise participate in the nation's governance was reserved for white, adult, male property owners. Anyone who is reasonably well-versed in the history of the United States will understand that the nation has experienced--and survived--many difficult moments before. And, of course, every generation is almost automatically bound to assume that the times they live in are the most important, the most exciting, the most perilous, or whatever, in the history of the country. Still, one finishes this book with a profound sense of foreboding, and you can't help but wonder if the age of rabid partisanship in which we now live, along with the tools now at the disposal of those who would divide rather than unite us as a people, will finally be enough to overwhelm the "truths" left us by the Founding Generation. What's most interesting is that there isn't all that much history to speak about. In all due seriousness, it has been what? 2 centuries? 3? Not quite. Before doing the 'sweeping volumes of history', a country should live those volumes first. The only good thing coming from this lack of historical tradition is that it should be very short and up to the point. It's easier to establish facts when the timetrack isn't too oversized. Still, somehow, this priviledge wasn't built upon. Instead, we have a rambling account, which starts (as tradition dictates!) at Columbus. Of all things. - The US didn't start with Columbus. It wasn't a thing until 1776, which gives the historian a measly period of 284 years to cover. - What about all those Norsemen, who discovered this continent 500 years before him? - What about all the Mayan and Incan and Aztecs? Were they officially worthless? Is it not enough to just destroy them, do we need to forget them, as well? From this one we mostly learn that they all died. Well, we sort of guessed it from the beginning. A very sanitized account. One won't learn from this 'story' just how the US came to be the only currently existing state built on ashes of indigenous peoples (other than Australian tribal woes) annihilated on a continent-wide scale genocide. 🐬Fun to read. I do love my flowery tales and metaphoric language. What I don't like is when they posture as serious lit, such as 'history volumes, civic lit... etc'. In an age of political polarization, Jill Lepore reminds us that there has never been an age without political polarization. The faintest familiarity with United States history should convince you that political conflict has deep roots. Some examples: the revolutionaries and loyalists fought vigorously over the issue of independence during the Revolutionary War; the Federalists and Anti-Federalists fought over federal versus state rights; the Mexican-American War was vigorously defended and oppos In an age of political polarization, Jill Lepore reminds us that there has never been an age without political polarization. The faintest familiarity with United States history should convince you that political conflict has deep roots. Some examples: the revolutionaries and loyalists fought vigorously over the issue of independence during the Revolutionary War; the Federalists and Anti-Federalists fought over federal versus state rights; the Mexican-American War was vigorously defended and opposed, as was the Indian removal policy, during the presidency of Andrew Jackson; proslavery and antislavery advocates fought intensely over whether new states should be admitted as free states or slave states; business has battled against labor since the 19th century; and the equality of races and sexes was vehemently defended and opposed for virtually all of US history. Further, congressional violence was common throughout the 1800s, as when John Wilson stabbed Representative J. J. Anthony to death during a dispute about the administration of bounties for the killing of wolves. In 1865, Charles Sumner, a prominent abolitionist, was attacked and almost killed with a walking cane by Representative Preston Brooks for criticizing slaveholders. For this act of violence Brooks was praised by many and then later reelected. Political duels were also common, as when Aaron Burr shot and killed Alexander Hamilton in 1804. The mass manipulation of voters is also as old as newspapers themselves, which have always been in the business of supporting candidates and causes. Radio and television were always used for purposes of propaganda, and advertising agencies were immediately employed for political purposes. In 1945, Harry Truman proposed a universal healthcare bill, only to see the bill killed by a targeted advertising campaign deployed by Campaigns Inc., a political consulting firm, that ran thousands of ads capitalizing on widespread Communist fears. Labeling the bill “socialized medicine” and “a product of Germany,” the agency manipulated the psychology of millions of people with scientific precision, long before Russia interfered with the latest 2016 US presidential election. The problems we face today are old problems with new technology, but the problems cannot be said to be more barbaric or more violent than the problems of the past. As Martin Luther King Jr. said, “The arc of the moral universe is long, but it bends toward justice.” Even if this progress is frustratingly slow, the conditions of today are far superior for most people compared to almost any point in the past, as horrific act after horrific act is painstakingly documented by Lepore throughout the book. The United States, like any other nation, has a complex history of conflicting ideas, motivations, events, and institutions, with an equal mixture of well-intentioned and noble ideas along with racist, evil, and destructive ideas. Lepore doesn’t hide the negative aspects of US history, but at the same time doesn’t focus on them exclusively. Lepore notes that the US was founded on the concepts of truth, reason, science, liberty, and equality, and that current and future progress hinges on these truths. The founders were creating, in their own words, the “American experiment,” based not on divine rule but rather on experimentation, freedom of speech, press, and religion, and open debate and free discussion based on principles of rationality. This is the essence of democracy as a political experiment; everyone is free to express their views, and differences of opinion are resolved through debates and votes rather than through violence. This is Enlightenment philosophy applied to the founding of a nation. Of course, the implementation of this ideal was far from perfect. It was not lost on anyone that the author of the Declaration of Independence owned hundreds of slaves. While arguing against the arbitrary power of English rule and stating that all men were created equal, Jefferson simultaneously denied liberty to hundreds of African Americans working his plantation. In fact, four of the first five presidents owned slaves, including George Washington, Jefferson, James Madison, and James Monroe. At the same time, Jefferson was ambivalent about slavery and did work to gradually end the slave trade, while others like Benjamin Lay were strident abolitionists even before the Revolutionary War. And so slavery, an obvious stain on the character of the United States, was a complicated issue with people on both sides and sometimes on both sides at the same time. While the United States has much to be ashamed of in regard to slavery and racism, the founders established the principles that the country could slowly live up to, even if the founders themselves fell short. By establishing a country based on the principles of reason, democracy, freedom, and equality, rather than on religion or divine rule, the founders set up the conditions for continued progress. But progress, like always, depends on living up to the ideals of reason, free speech, humanism, liberty, and equality, and not backsliding into religiosity, racism, violence, and authoritarianism. And, like always, it also depends on an informed public, able to leverage the power of their own reason without falling victim to the manipulation of mass media or to the echo chambers of their favorite news outlet or internet site. As citizens of the US, each of us has access to more information than any previous generation, yet in practice most of us consume information from a much narrower range of sources. The remedy to the problem of mass manipulation has always been the same: the development of critical thinking skills within the population, a commitment to reason, intellectual humility, and the toleration of competing viewpoints that can be debated in a civilized manner. Regardless of which technology becomes available, progress forever hinges on our ability to live up to these ideals and these truths. One of my favorite genres to read in nonfiction are broad, sweeping narratives of American history. Thus, when I heard about THESE TRUTHS last year, I couldn't pick up a copy fast enough. And folks, let me tell you: this one does not disappoint. Jill Lepore is an absolute phenom when it comes to historical context, adding new layers and elements to many of the most complicated eras in our short history. That said, Lepore does not shy away from some of the lesser-known aspects of our history (at One of my favorite genres to read in nonfiction are broad, sweeping narratives of American history. Thus, when I heard about THESE TRUTHS last year, I couldn't pick up a copy fast enough. And folks, let me tell you: this one does not disappoint. Jill Lepore is an absolute phenom when it comes to historical context, adding new layers and elements to many of the most complicated eras in our short history. That said, Lepore does not shy away from some of the lesser-known aspects of our history (at least, lesser-known to me). The early America coverage, including that of Columbus and the first settlers in Jamestown, is particularly interesting, though I only wish there had been more. It doesn't feel rushed, but Lepore certainly focuses her immense talents on the later 19th century and the monumental 20th century. Of particular note was Lepore's routine hearkening back to the framers of the constitution when looking at some of our more modern problems—putting them into historical context. And much of the darker side of American history, sorely lacking from many previous tomes in the past, is skillfully uncovered here. It's hard to write a history of the United States from the beginning to now. Lepore is perfectly suited for the task --she's a great historian and a great writer. The best thing about this American history is that it includes the women and the racial minorities that are usually left out. As such, it's a history of America--warts and all. With so much ground to cover, it would be easy to leave out the incidental players, but as Lepore shows brilliantly, it's impossible to understand America witho It's hard to write a history of the United States from the beginning to now. Lepore is perfectly suited for the task --she's a great historian and a great writer. The best thing about this American history is that it includes the women and the racial minorities that are usually left out. As such, it's a history of America--warts and all. With so much ground to cover, it would be easy to leave out the incidental players, but as Lepore shows brilliantly, it's impossible to understand America without showing the conflict between America in theory and America in practice. Oof. This is a very, very good book. Difficult at times, depressing at others, always well-written, well-put together. This book has been heavily touted. That makes it all the more disconcerting to see an error as early as page 8 and a whopper to boot. Indeed, beyond that as representative of numerous errors of fact, there’s numerous arguable errors of interpretation, and dubious decisions what to contain and what to omit. Behind THAT, as Gertrude Stein said of Oakland, as far as I can tell, there’s no “there” there. Page 8: No, pre-Columbian American Indians did NOT herd pigs because there This book has been heavily touted. Page 8: No, pre-Columbian American Indians did NOT herd pigs because there were none in the New World! 33: Kind-of sort-of on the Virginia Colony. Its original grant went to today’s Canadian border on the coast; a reformulation in 1609 changed that. Hence the worries of the Separatists fears of settling in Plimouth in 1620, even though they had no charter from the crown for anywhere. 116ff. Ignores larger background of Shays Rebellion, and issues related to this in the Washington Administration, ie, the promissory notes for land offered to veterans, speculation on them and repurchase, etc. 145: America had political factions, and alliances, of various sorts long before federalists and anti-federalists. And the Founders knew that. 1790s newspapers did not spring parties into being, and the Founders should have known that. World War I take? Wasting pages on Germany being criticized by fundamentalists for higher criticism, and making that the intro to Bryan and Scopes, with almost zero coverage of the controversy over entry into the war itself, and Bryan’s time as Secretary of State? Horrible. As for Wilson’s health, he arguably had at least one mild-moderate stroke, and more than one mini-strokes or TIAs, a few years before the War. Even worse, on her Polk land-seeking claims, this heavily footnoted book had NO footnotes. 410: I see no need to put “illegal alien” in scare quotes after first reference. 450: Doesn’t mention FDR playing a behind-the-scenes role in the defeat of Upton Sinclair. Doesn’t even mention that he refused to publicly endorse him. Doesn’t mention that he tried to get Sinclair to drop out and that support was offered to GOP incumbent Merriam when he refused. 717: Given that Bush v Gore was the apotheosis of a further rightward shift of the Supreme Court, it gets short shrift. Basically, after I got a little way into the book, I began wondering what her intended audience was, and what her angle was. I had in mind something like Howard Zinn’s book. Zinn had several errors of interpretation, but he had an interpretive focus. I did learn tidbits and things, and learn enough about Lepore's writing, not to one-star it. Plus, I thought a two-star review would be less easily dismissed. "To study the past is to unlock the prison of the present." "The past is an inheritance, a gift and a burden." History lovers will delight in this one volume political history of the United States. I enjoyed learning about facts, stories, and characters I was unaware of before. That famous quote that history doesn't repeat itself but it rhymes, is so true. I saw so many echoes of the past in our present day as I read this "To study the past is to unlock the prison of the present." In this work, Jill Lepore creates a civics book for the rest of us. Spanning the depth and breadth of American history, Lepore weaves together both summary and synthesis of other historians' work to create an informative tome, including her own. If you're looking for the one book on American history, this is it. If you're an avid history reader, you'll recognize the broad strokes Lepore paints of historians' arguments though she keeps it from sounding as dry as historiography*. I was paying atte In this work, Jill Lepore creates a civics book for the rest of us. Spanning the depth and breadth of American history, Lepore weaves together both summary and synthesis of other historians' work to create an informative tome, including her own. If you're looking for the one book on American history, this is it. If you're an avid history reader, you'll recognize the broad strokes Lepore paints of historians' arguments though she keeps it from sounding as dry as historiography*. I was paying attention through the majority of the work, but I myself run into mental barriers in the mid-20th century where my interest just plummets through no fault of the author's. Brain: Were your parents alive when event x, y, or z happened? I've always liked Jill Lepore's work because I feel she is a kindred spirit, whether imagined or otherwise. To me, she represents a fellow New England scholar with similar interests, including early American history and comics. And my professional work-grandfather librarian thought very highly of her, so it's been ingrained in me. And she's also just excellent at what she does: research and writing. By her measure, I still have three years to create and publish my own Bancroft Prize winner. No pressure. *Addendum: I have now (12.19.18) paged through the acknowledgements and bibliography. Her work is wondrous, noting, "To write this book, I undertook the incredibly delightful and joyful work of learning and writing about many people, events, ideas, and institutions I'd never studied before and reading the work of generations of distinguished American historians and political scientists" (791). She continues in the bibliography, "This book draws on innumerable primary sources and a sprawling scholarly literature. I have tried both to identify my chief sources and to keep citation brief. I have favored citing primary sources over secondary literature" (793). And, you know, the archivist and historian in me just loves that the notes are 87 pages (and that's considered brief! Hilarious. I love it!). I'm reading this in four parts (because I can't handle 900+ pages in one go). I'm treating each part as a "book" for the purposes of my GR reviews (so that this book isn't lingering on my "Currently Reading" shelf for 12 months or so). (read from 12/4/18-12/16/18) - finished! This is very interesting, and readable, with fascinating details (the first British colonists turned to cannibalism! ), but maybe Lepore has attempted too much. Of course in a brief his I'm reading this in four parts (because I can't handle 900+ pages in one go). I'm treating each part as a "book" for the purposes of my GR reviews (so that this book isn't lingering on my "Currently Reading" shelf for 12 months or so). Overall, this suffered from a lack of focus, with much confusing jumping back and forth from person to person and from year to year. I realize it's impossible to avoid some of that, but I wished for a bit less than we got. I recently finished the excellent Stamped from the Beginning: The Definitive History of Racist Ideas in America, and I thought it was interesting that Kendi showed evidence that one of the causes of the American Revolution was to maintain slavery, but in this book Lepore implies that the those in favor of abolition of slavery were the same people in favor of Revolution. She also points out that the Caribbean colonies of Jamaica and Barbados did not participate in the Revolution because they feared additional slave rebellions, thus slavery was a reason they did not want Revolution. There's been a lot of "the Founding Fathers intended ..." talk in this country recently, so I was especially interested to read the details of how they first set up the USA government, and what their hopes and plans were. A democracy, in which the people “assemble and administer the government in person,” will always be subject to endless “turbulence and contention,” [Madison] argued, but a republic, in which the people elect representatives to do the work of governing, can steer clear of that fate by electing men who will always put the public good before narrow or partisan interests, the good of all above the good of any part or party. Madison argued that it could only work if a republic were large, for two reasons. First, in a large republic, there would be more men to choose from, and so a better chance, purely as a matter of numbers, for the people to elect men who will guard the public interest. Second, in a large republic, candidates for office, in order to be known and to appeal to so large a number of voters, would need to be both notable and worthy. ... as early as 1791, Madison had begun to revise his thinking. ... “The larger a country, the less easy for its real opinion to be ascertained,” he explained. Yeah, I'd say he was right about that. The "Founding Fathers" (Washington, Jefferson, Madison, Franklin, Hamilton, et al) were really worried about holding the new country together. But the USA is such a mess right now, I wish they had just let it naturally fall apart after the Revolution. I think we'd be better off today as a group of separate but cooperative countries. I'm feeling really hopeless about the current Administration. Whenever you read an ambitious work of history written by a single author (Gibbon's Decline and Fall and Taruskin's History of Western Music come to mind), you first have to marvel at the accomplishment and then, over the course of careful reading and evaluation, come to find just how well they have represented fact while simultaneously making their opinions known - first of all to be opinions - but to be grounded in the facts already mentioned. Many do not measure up to that initial awe-inspiri Whenever you read an ambitious work of history written by a single author (Gibbon's Decline and Fall and Taruskin's History of Western Music come to mind), you first have to marvel at the accomplishment and then, over the course of careful reading and evaluation, come to find just how well they have represented fact while simultaneously making their opinions known - first of all to be opinions - but to be grounded in the facts already mentioned. Many do not measure up to that initial awe-inspiring reaction, this volume does. In this absolutely absorbing 900-page work, Harvard Professor and New Yorker contributor Jill Lepore has really done the impossible, that is, to take the subject of civics and deal with it honestly and fascinatingly over the course of the entirety of US history. To be clear, when talking about "civics" which is a word foreign to many and misused by even more, we are discussing the complete idea of what it means to be a citizen involving the political and theoretical dimensions as well as the rights and duties contained therein. Rather than a mere concatenation of historical events, this book delves deeper into the motivations and philosophies of those engaged in these events from our founding as a nation through every bit of turmoil we have encountered since, providing a wealth of biographical information along the way. The discussions that Jill Lepore engages in are told with a firm commitment to facts, the very center of any discussion, and a depth of honest feeling behind every opinion expressed. While I enjoyed the entirety of the work I must say the most illuminating section for me was the emergence and role of the earliest political admen consultant firms along with the rise of polling firms. While of course very aware of the role they play currently, the very earliest history and machinations of said enterprises was at times shocking in the most cynical of fashions. Guess I never got around to writing a review (though I could have sworn I did). I'm not going to do so now. I'll simply say this book is wonderful and should be read by everyone who cares about our current situation -- our politics, cultural upheavals, mutual distrust -- and how we got here. It hasn't been very long since I read it, but I've been listening to several podcasts with Lepore and I find myself strongly tempted to read it again or download it so that I might listen to it. The good news: "only" 809 pp of actual text (hc ed). The bad news: she starts her History with Columbus's voyage of discovery. She starts in Haiti/Hispaniola, and uncritically quotes Bartolome de los Casas 16th C. guess that Hispaniola had a pre-Spanish population of about 3 million, which fifty years later had declined to 500 natives! My BS detector sounded, since this was uncited, and indeed per https://en.wikipedia.org/wiki/Ta%C3%A..., the max modern estimate for pre-Conquest Hispaniola is ar The good news: "only" 809 pp of actual text (hc ed). The bad news: she starts her History with Columbus's voyage of discovery. She starts in Haiti/Hispaniola, and uncritically quotes Bartolome de los Casas 16th C. guess that Hispaniola had a pre-Spanish population of about 3 million, which fifty years later had declined to 500 natives! My BS detector sounded, since this was uncited, and indeed per https://en.wikipedia.org/wiki/Ta%C3%A..., the max modern estimate for pre-Conquest Hispaniola is around 500,000. Whatever the number, within 30 years 80 to 90% had died of European diseases (which was typical through out the New World after European contact), nor were they treated kindly by the Spanish. But I was taken aback that a historian of Lepore's standing would start her account with such an obvious blunder. I give up. Abandoned at (to be added), for professional misconduct. Well-written but untrustworthy. "... at the time of Christopher Columbus’s voyage, Lepore notes, the Americas already contained more people than Europe. Three million Taíno lived on Hispaniola alone, as Columbus called the island where he first made landfall, believing he had found the edge of Asia and a trade route to the East. He wrote in his voyage diary of how easy it would be to enslave them, which Spain soon did to mine gold and grow sugar, and within fifty years, their population had dropped by more than 99.9 percent. ..."
"In the century after Columbus landed, Europeans carried back nearly 200 tons of gold and 16,000 tons of silver ..."
A pessimistic history that runs close to 1000 pages. Of course America has committed sins, but are there any positives to be found? According to Lepore, very, very few. A history of the United States for our time, that tells the story of America from Columbus to Trump. It has been a quite a while since I’ve been this impressed by a history book (and my shelves testify how much of them I read). These Truths is a splendidly written account that the author intends to also be a civics primer. I learned a great deal about America and I enjoyed reading it immensely. Jill Lepore looks at the subject through the theme of truth, as the nation was founded on a truth clai A history of the United States for our time, that tells the story of America from Columbus to Trump. It has been a quite a while since I’ve been this impressed by a history book (and my shelves testify how much of them I read). These Truths is a splendidly written account that the author intends to also be a civics primer. I learned a great deal about America and I enjoyed reading it immensely. Jill Lepore looks at the subject through the theme of truth, as the nation was founded on a truth claim. There is a heavy focus on the news media and how the development of new ways of reporting affected outcomes in each generation, which is highly relevant to present concerns. You will come away from this book knowing a lot about political campaigns. There is also for topics that aren’t usually covered in history books, such as the impact of computation (which was fascinating to discover). I particularly enjoyed finding out about the growth of Christian fundamentalism and the life of Phyllis Schlafly. The biographical details of the figures in this book was a highlight. Lepore also discusses the writing of history and how it has been used in the past. The roots of the current partisan divides are explained. By too many reviewers this book has been held up as a 1-volume history of America, from Columbus to Trump. Actually, it's much more of a history of ideas, specifically of the founding and guiding of "truths," and as such, it flows through the centuries with insight and perspective. Lepore's an excellent writer, building transitions and inserting humorous commentary that delighted this reader. "Dewey ... proved about as good a ca By too many reviewers this book has been held up as a 1-volume history of America, from Columbus to Trump. Actually, it's much more of a history of ideas, specifically of the founding and guiding of "truths," and as such, it flows through the centuries with insight and perspective. Lepore's an excellent writer, building transitions and inserting humorous commentary that delighted this reader. Ultimately, I came away from my reading depressed by the contradictions in our quest for the truths of freedom and equality, also reconsidering what for me were more the footnotes of history ... things like polls, progressivism, and Phyllis Schlafly. A beautifully written book, an expansive one-volume history of the United States from Christopher Columbus to the Presidency of Donald J. Trump. I appreciated several things about this book. First, the author threads a needle between the celebratory and hyper-critical research. She's not afraid to celebrate many of the great accomplishments of our country; nor is she reluctant to point out the mistakes that our country has made. This author isn't afraid of pointing out mistakes made by liberals A beautifully written book, an expansive one-volume history of the United States from Christopher Columbus to the Presidency of Donald J. Trump. I appreciated several things about this book. First, the author threads a needle between the celebratory and hyper-critical research. She's not afraid to celebrate many of the great accomplishments of our country; nor is she reluctant to point out the mistakes that our country has made. This author isn't afraid of pointing out mistakes made by liberals or by conservatives (and all of the varieties of beliefs in between in our vast history). Second, there is a sense of magic and poetry in much of the writing, and the author has a great eye for some details that are left out of most broad history books. For example, she focuses a bit on Harry Washington, one of George Washington's slaves who escapes to Sierra Leone and leads a rebellion there. Throughout, the author is able to help readers see connections between events that might have seemed unrelated to each other. This is largely a history of the politics of the USA, though she focuses on military issues and economic issues throughout as well. Jill Lepore makes it easy to read authoritative accounts of our history as a nation. She is already a venerable historian. These Truths offers two things that I crave when I’m reading/learning history: context, and a penetrating commitment to seek truth in terms of what they were thinking and what they knew way back when. Barely w Jill Lepore makes it easy to read authoritative accounts of our history as a nation. She is already a venerable historian. Barely weeks away from the November 1864 presidential election, Abraham Lincoln expected that he would lose his bid to stay in office. Hannibal didn’t know what the other side of the Alps looked like, and didn’t know what he would find there, if he made it across. Eli Whitney was tinkering in the shop in 1793, watching a cat trying to pull a chicken through a fence, when he invented the cotton gin—he didn’t know that the machine would make slave-based cotton agriculture a booming industry in the 19th century before the American Civil War. Lepore puts a lot of history into These Truths. Her scholarship and her insights make it obvious that every reader has a lot to learn. I learned something on every page and thought “I wish I had written that!” much more frequently. It’s a stunning thing, to produce a single volume of American history this sweeping and compelling and richly written. Of course, it’s impossible to include everything, and there were often times that I wish she would have covered this or that. That said, I’m just floored by the narrative audacity and the degree to which she pulled this off. This is an excellent one volume edition of American history, perfectly tying it in, with our current racial and political environment. Kudos to Lepore for an awe-inspiring achievement. OK, so this book is breathtaking and very tight for a history of the United States since Columbus's first contact with the Americas. It's pleasurable and compelling and not once did I get bored. She has a thorough argument about the relationship between "truth" and the thrust of U.S. history, and some of the threads she follows throughout the story are just... stunning. There are a few moments in the last chapter that are going to anger / frustrate just about everyone, but to be fair to her, I t OK, so this book is breathtaking and very tight for a history of the United States since Columbus's first contact with the Americas. It's pleasurable and compelling and not once did I get bored. She has a thorough argument about the relationship between "truth" and the thrust of U.S. history, and some of the threads she follows throughout the story are just... stunning. There are a few moments in the last chapter that are going to anger / frustrate just about everyone, but to be fair to her, I think she came to the conclusions that she has based on a very deep knowledge of United States history. I heartily recommend that people interested in American History - thoughtful American History - read this book. It is a well-written, thoughtful, and enlightening statement on the history of the US from 1492 until the Presidential Election of 2016. Jill Lenore is a Professor of History at Harvard. She has written on a variety of topics, from Benjamin Franklin’s sister to the writings of street people, to the history of the Wonder Woman comic book character. She is also an accomplished essayist wh I heartily recommend that people interested in American History - thoughtful American History - read this book. It is a well-written, thoughtful, and enlightening statement on the history of the US from 1492 until the Presidential Election of 2016. Jill Lenore is a Professor of History at Harvard. She has written on a variety of topics, from Benjamin Franklin’s sister to the writings of street people, to the history of the Wonder Woman comic book character. She is also an accomplished essayist who regularly contributes to the New Yorker. I first ran across her work when she came into conflict with some of the established Gurus at the Harvard Business School. She is brilliant, funny, and fearless. She is one of the few authors who I will move to the top of my queue when I hear of a new book that she has written. “These Truths” is a history of American law, culture, and institutions - a history of how America came to view itself at different points of its history as a result of political and economic and other developments at the time, in conjunction with the trajectory of the US past up to a given time. So as a result, there is not a detailed accounting of military or political or economic or social developments, but rather an evolving interpretation of American self-consciousness. This is a tall order to carry out and the book will be better appreciated by readers who already have some familiarity with US history. If this is a weak spot for a reader, I would recommend having a search engine up and running to run down some of the facts and allusions that fill the book. You can also follow her citations to find out more - the references are helpful. To me, the major contribution of the book is to draw together an amazing range of new scholarship on US history that has fundamentally changed how scholars and educated readers now look at the American past. For example, the role of slavery and the cotton economy in the founding of the country and its development up through the Civil War and afterwards has completely changed since I first started reading a long time ago and it is impossible to escape in serious writing. Professor Lepore covers and integrates this research superbly and it is central to her narrative. Is the book perfect? No - but could it be perfect or complete? However, I cannot think of other topics that she should have covered in place of those that she chose to spend her time on and it is possible for a book, even a fine one like this, to be too long. This is such a rich book (as well as a long one) that it would be foolish to summarize anything. The closest I will come is to say that Professor Lepore continually tries to critically examine the US and its mission - and to note the ongoing tension between what the US has claimed to be over the course of its history and the reality of the messy state of the republic as it works through its history. This is clearly a labor of love for her and the book proves that an honest and thoughtful history shows the greatness of the country along with its warts, tensions, and continuing problems. I cannot speak to how US history is currently being taught in colleges or secondary schools but this book would be a fine addition to a number of class reading lists. Needless to say, the closer Professor Lepore comes to the present, the messier the story seems and the more her chapters come across as essays on current events. They are still worth reading, especially her closing work on Obama, the Internet, and even the current president. Lepore explores the "self-evident truths" of America as each generation understood and practiced them. It is a book that asks the question, what is America and who is American? Why I started this book: Recently arrived at the library and I thought that it looked good... not realizing the affirmation and trauma that I would be participating in with this hefty book. Why I finished it: This book was awesome, one of the best history books that I read. Lepore excels at putting history in context, inc Lepore explores the "self-evident truths" of America as each generation understood and practiced them. It is a book that asks the question, what is America and who is American? 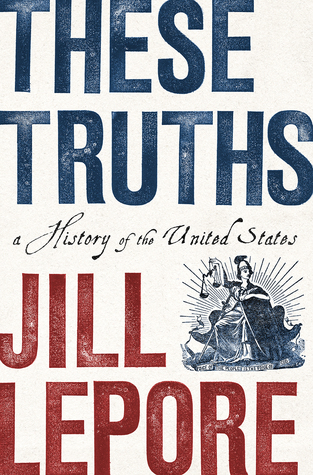 American historian and frequent contributor to The New Yorker, Jill Lepore, in “These Truths, a History of the United States,’’ presents nearly 800 pages of compelling American history that many of us might not have learned in the classroom. Considering the “American experiment’’ was supposed to rest on three political ideas: “political equality, natural rights, and sovereignty of the people,” Lepore skillfully teases out the many contradictions and falsehoods in the Republic’s long history. Just American historian and frequent contributor to The New Yorker, Jill Lepore, in “These Truths, a History of the United States,’’ presents nearly 800 pages of compelling American history that many of us might not have learned in the classroom. Just a few months before Thomas Jefferson wrote, "All men are created equal" in the Declaration of Independence, for example, one of America’s most celebrated Founding Fathers put out an advertisement in the newspapers offering money for the return of one of his slaves. In a country that purportedly promoted rights, among these rights: “Life, Liberty and the pursuit of Happiness,” it took until 1933, well into the 20th century, before Congress passed any meaningful anti-lynching laws. Between 1882-1930, Lepore reports, more than 3,000 black men and women were lynched in the United States. Women and black Americans played a significant role in World War II, but shamefully never benefited the way white Americans did from the The Servicemen's Readjustment Act of 1944 or the G.I. Bill as it became to be known. The bill paved the way for low interest loans and paid college tuition for many returning veterans; except, that is, many women and African Americans who were barred admittance into many colleges and universities. Many black Americans, moreover, were denied low interest loans from financial institutions despite fighting for this country’s freedoms and risking life and limb on the battlefield. Amazingly, Lepore informs readers that the University of Pennsylvania in 1946 housed a student body of 9,000. Of these, only 46 were black. Lepore covers a great deal of seminal moments in American history, including the rise of Donald Trump and the fall of the ‘’triumph of facts” over opinion, which was supposed to be the hallmarks of the Penny Press in the 19th century. We are now living in a world of “Fake News”; we witnessed a presidential election in 2016 in which Facebook was littered with misinformation by certain groups in hopes of swaying their political views. And, most troubling, we’re living in an age where the President of the United States is using Twitter as his bully pulpit to bully and harangue enemies, most of the time without any concrete facts. Aside from the gripping history Lepore presents, readers who love presidential trivia or who are cramming for Jeopardy, would love this book for the wealth of information the author provides; from Andrew Jackson being the first candidate to distribute political buttons to Dwight D. Eisenhower being the first U.S. President to be baptized in the White House. In an age of people gathering their information from Twitter and quick sound bites on the Internet, it’s refreshing to read about the many issues the country is facing; only Jill Lepore is providing these issues with facts, well developed narratives, and placing it in its correct historical context, something she does so marvelously. Self-evidently, a very timely and unique read on American History, with many nuggets and cipher on the many pertinent moments in history we have sadly come to read and appreciate as received cliché of remote times and genre. The narrative depicts four epochs of the American history, The Idea, The People, The State, The Machine. Wow, utilitarianism, phenomenology, jurisprudence and technology all in one breath – or may be one semaphore it should be. The writing happens to come across as so contemporary. My favorite stories – King James, 1812, slavery around the revolutionary war and independence, Jefferson on Malthus, Madison on Newspapers, electoral collage, Marbury v. Madison, 1856 laying of the Atlantic cable, Citizenship, Pulitzer on Mary Lease, Turner on Fredrick Douglas, Plessy v. Ferguson, 1899 the Philippine-American War , 1917 Buchanan v. Warley, MULLER V. OREGON, William Jennings Bryan on Eugenics, 1919 Ho Chi Minh in Paris, Lippmann’s House of Truth with Hoover, Gini Index, UNIVAC on Fake News, Tet on Robert McNamara, 1973 Gallup on Precision Journalism, Nixon on NRA, 1986 Lost Amendment, Reagan on Originalism, 1985 Meese on “charter for judicial activism.”, Anticommunism as a unifying ideology for racist, sexist, classist, or homophobic, Clinton on Mass Incarceration, Atari Democrats’ financial system, epistemological abyss as Trump, 2006 ACLU torture memos in Hamdan v. Rumsfeld, Current Gallup response rate in Single Digits contrasted to 90% in 1930’s, The average annual temperature in Philadelphia at the time of the constitutional convention was 52 degrees Fahrenheit.2 By the end of Barack Obama’s presidency, it had risen to 59 degrees. . . . to name a few. There are many good things about Lepore's book, but the best thing is its title: "These truths" asserts both the core philosophy of the founding and the badge of identity for every historically-aware American citizen. In Lepore's hands it becomes the proving ground and interpretive filter by which to judge the people and events of American history. While it must needs always return to its origins, "these truths" also refers to other beliefs of the American people at large, as well as those who ha There are many good things about Lepore's book, but the best thing is its title: "These truths" asserts both the core philosophy of the founding and the badge of identity for every historically-aware American citizen. In Lepore's hands it becomes the proving ground and interpretive filter by which to judge the people and events of American history. While it must needs always return to its origins, "these truths" also refers to other beliefs of the American people at large, as well as those who have influenced them, and the manner in which those beliefs have trimmed, ignored, or outright contradicted the founding principle. In doing so she performs a salutary piece of rescue from the basket of truism into which "these truths" have a way of falling. A good example is her handling of Magna Carta: It was "almost entirely forgotten" in 1621 when Edward Coke "dusted off a copy" in order to constrain the divine-right pretensions of James I. It "had been revoked almost immediately after it was written, and it had become altogether obscure" by the time of Coke and James, when Coke "resurrected it in the 1620's and began calling it England's 'ancient constitution'" that showed "law to be above the king." More importantly, perhaps, for Lepore's project, Magna Carta established the right to trial by jury, a fundamental form of determining truth: "In England, truth in either a civil dispute or criminal investigation would be determined not by God but by men, and not by a battle of swords but by a battle of facts." A central theme of the book is the way in which truth has been understood, believed, sought, and propagated throughout American history. Her prehistory of the republic reveals the staggering impact of the discovery of the New World on the mind of the Old one. How to absorb and understand it, set it up against the truths that had been known since time immemorial, only to be swept away by a discovery enormous in territory and wealth? Those twin temptations provide the foils -- in the form of Indian extermination/removal and African slavery -- that all but dissolve both philosophy and charity and reveal the stark brutality of those "truths" that always and only seek advantage. When the cause of liberty stirred, the huge contradiction of slavery did not go unnoticed. Independence won, that contradiction almost scuttled the national experiment. And yet, if anything -- in my experience, anyway -- the history of slavery is generally downplayed by historians trying to cover all the bases. Lepore returns it to its central place. Writing about the Emancipation Proclamation, she writes, "American slavery had lasted for centuries. It had stolen the lives of millions and crush the souls of millions more. It had cut down children, stricken mothers, and broken men. It had poisoned a people and a nation. It had turned hearts to stone. It had made eyes blind. It had left gaping wounds and terrible scars. It was not over yet. But at last, at last, and end lay within sight." Throughout, Lepore confers agency upon groups left out of the governing compact: enslaved blacks escaped to freedom whenever and wherever they could; through their agitation and militancy, women influenced the substance and style of politics even though they could not vote. In the Confederacy it was white women protesting conscription (the act of a central government in a system that supposedly opposed central government power) that produced a system of government relief for soldiers' wives. "The rise of the modern welfare system is often traced to the pension system instituted for Union veterans in the 1870s, but it was the Confederacy--and Southern white women--that laid its foundation." Similarly, actors less noticed by conventional memory receive their due as influencers: the shadow of Phyllis Schlafly's mobilization of women looms over the conservative resurgence, from Nixon to Trump. Mary Lease exerts a similar influence over Populism, as does Leone Baxter in the perfection of the means by which to form and shape public opinion through corporate, political PR. The public mind is of great interest to Lepore. At the time of the Revolution, "members of Congress might have been philosophers, reading Locke and Montesquieu. But ordinary Americans read the Bible, Poor Richard's Almanack, and Thomas Paine." Paine educated his readers: "Digesting Locke for everyday readers, Paine explained the idea of a state of nature. … The rule of some over others, the distinctions between rich and poor: these forms of inequality were not natural, nor were they prescribed by religion; they were the consequences of actions and customs." Political developments depend on the articulation of viewpoints. Lepore follows the career of the American media from the earliest newspapers to the anarchy of the Internet. Beginning in the 20th century, much of this leaves the realm of journalism and descends into attempts to form, shape, and control public opinion, as predicted by Walter Lippman in 1922: "Mass democracy can't work, Lippmann argued, because the new tools of mass persuasion -- especially mass advertising -- meant that a tiny minority could very easily persuade the majority to believe whatever it wished them to believe." Polling is another aspect of this phenomenon, and was used as a suggestive device for creating opinion where none existed before.